As promised, here are some photos of some early protos, failures and production lures made up to about 1993 -4, then I gave it away until around 2006 because I didn't like what I was making. Sorry but dates are approximate as is my memory --- I checked with a good friend as we were both making some Bass lures at the same time, we calculated we began swallowing dust about 1979...................... then started to catch fish on them--Bass and to our surprise, some BIG bream, I was/am hooked. Very early these seven lures. #2 is probably the oldest, I wanted to make something bream shaped, easy, but making it swim took forever. #4 is a copy of a "Shakespeare Little S" -cedar. #5-6-7 signs of things to come, 70mm, anodised gold aluminium bibs (top side), nice action, never caught much -cedar. Below- Around 1984-87, Still playing with shapes- #1 an attempt to turn the bibles lures into bibbed lures, didn't like it--#2 -3-4-5-6 were the first 'commercial' lures I made, distinguished by 50mm Balsa bodies, tow eyes made from thicker wire @ apx .8mm (as opposed to the earlier lures which had .5mm wire) , pressed/ faceted aluminium bib, doll eyes, weighed about 5.5 gm. Funny thing is, #6- and #7 were probably two of the best colours I made but they never sold. Below--- 1987- 93-- I needed a quicker way to add 'hook hangers' so tried to make a die to cut my own hanger plates, a lot of time / drilling-filing etc to find I was no 'Tool Maker'--Found a real tool maker and paid considerable $'s to have a die made, then cut 3000 x 50mm x 1mm brass hanger plates which probably cut down build time by about 30%, or @ about 4 lures /hour = about $17 / hr less hardware costs WOW.!!!!!!!!! #1 the only lure I have with my original 'hanger plate' (Aluminium), worked but was an ill fitting thing, I was making the lure to fit the plate?? instead of the other way round. #2-3-4-5, the new brass hanger plates--NIRVANA. In about 1987-88 #3 caught a 13.8kg cod and was retired immediately . #5 is a 1992 model, these were made using a router (red cedar), never liked them, compared to the others pictured it looked too high in the back, worked well, caught fish-- and for some reason Bream liked this particular colour. #6 - New 1mm x 5cm Brass hanger plates. Below----Some prototypes !!!! #1 -#3 (50mm) very early models trying to avoid bibs, worked o.k but nothing different, sometimes a bit erratic. --#2 and #4 (50mm) made with double bibs (one with copper , other Al) were interesting, very little action but went pretty deep, discarded these as 'action' was king back then--Now I am tempted to give them another go, 'Rapala CD's' have the same action @ 1/10th the depth. #4 is showing signs of "Aeroplane Dope" cancer, I have a few of these so no longer use it. #5 a trial 'Vibe', never caught anything. Of the four made, the last two made worked ( had 4 segments), the action of these TYPE of lures when perfected is something to behold. #7 - is a bibbed sheet brass lure, I thought it would be easy/quick to make, never worked, maybe today with a little more experience I /we may be able to get it to shake. Below- A "Shop Sample Board' (all 50mm lures), there were two boards made, I have one------- the "?" was probably a " Eucumbene Green" sample colour, a great trout catcher that never really sold, so I removed it. colours and top sellers- Frog pattern was good for trout, bass and cod-- fluro orange was also a good seasonal trout colour, bream didn't mind it either. very interesting thanks for putting together and sharing your lures amd manufacturing history. Thanks for posting that, I found it an interesting read. A great read Peter, thank you for sharing. Marc - STDZ Lures - Catch fish,fish a STDZ instead. Great read into where you have been with your lures. RRRRRRRRRR the Swimbait hey. I have been working on one for a few months now and still no real joy. they are evil things. Wow pete...it was great to see some insight as to where you started and the progression and development along the way. You have certainly tried a few things. I didnt realise that you sold lures commercially but I am not surprised looking at what you produce today. At least now it is archived in LL for all to enjoy. Thanks Pete for taking the time to put up. You have played with a lot of different materials. Pete great story, I have these they look like yours, any idea on there age?? That's a great read! 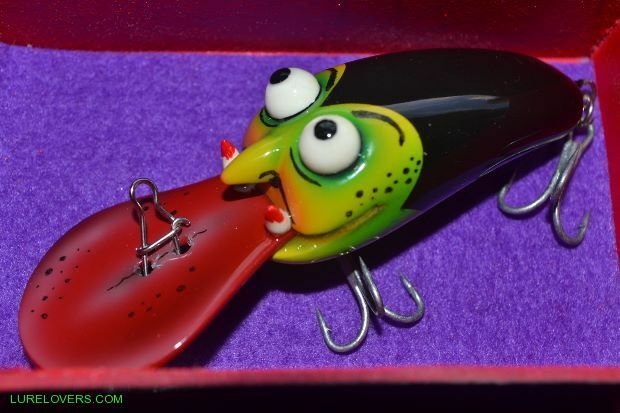 Your progress and innovation, and the heartache from great lures not selling! Love the two bibs! Curious about how deep and action they have? Certainly got me thinking but I'm a long way from knowing how to put that together! It's only a stick untill it has TEETH MARKS in it!!! Jas- thanks mate, I think you may a at least one I don't. I'm still scratching my head here, I'm thinking maybe someone dug them out of Eucumbene or Jindabine Dam , still can't remember selling them but that's not unusual . Matt- From memory they had a 'Rapala' CD sort of action, just a gentle sway and rather than a steep dive, they planed down horizontally - how deep? I don't really know, as we probably never had 'sounders / sonar' back then, all I know is they disappeared . there are two different shapes there, the copper bibbed one would have been made around 83 -84, the other more modern shape was made soon after-- see pic 3 - #1 and #2 are different shaped blanks although they both have large bibs?? Thanks again everyone for posting . A few of my favourites.... the bumble bee gets me smiling everytime. the old and the new.........Thanks pete....top lures from a top bloke. Some classics in that lot Nicho....I wish I had a few of them! That yellow/black lure in the top left in the first pic, does it have a hole cut into the bib? If so, what difference does it make to the action? Absolutely NIL 'fly'- a lot of those pictured probably don't even swim, most were protos. Thanks for posting those Jas. I was having dinner at a mates place recently and telling him how I had very few of my old lures in good condition !! 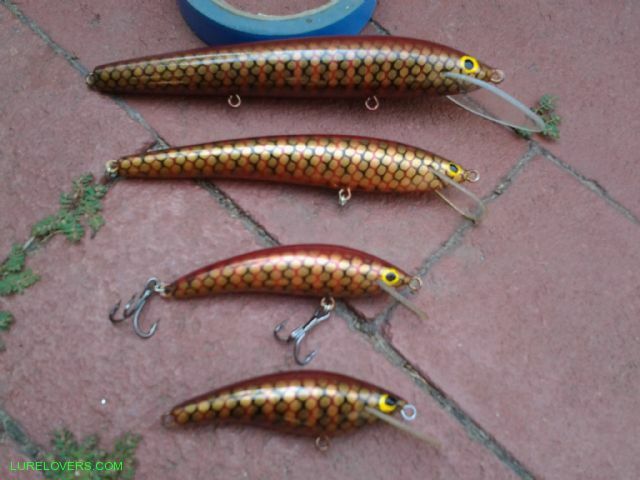 These are the only 5cm lures of mine (on cards) that I have seen since about 1992 - the brown one must have been a 'market tester' and probably only made 10 as this colour never sold well, although as happens with a lot of colours, it was/is a good trout colour. Esoteric lures "For The Select Few"
Well I finally got around to finishing my RAYNA display for the shed....I bought a few old display cases last year with full intentions to have this done well before now. IM CLEANING OUT MY SHED IN A BIG WAY!!! as I cant even get into it!...lifes been far too busy of late.. but Im slowly getting around to long awaited projects. 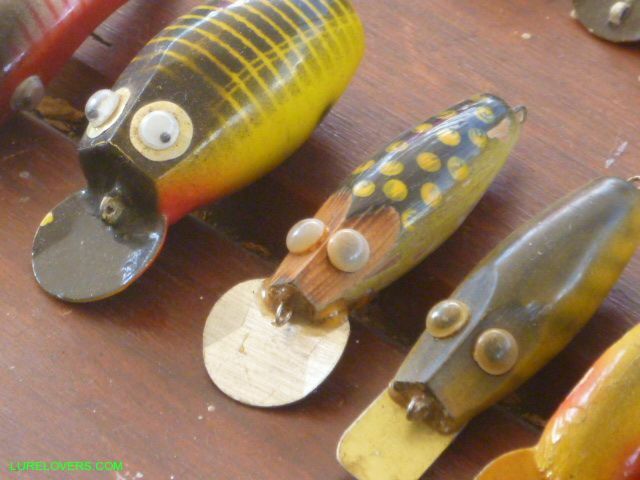 This lot has a good mixture of petes old lures from the 70s and early 80s up until current....even found a few blanks with all the components waiting for jack and myself to paint and construct....something we have to do soon, as we have been very slack. A couple of these lures still get used....the red and black one in there has caught a heap of bass. Only need a couple more lures to fill in the gaps and its completed. Awesome display Nicho.....they look great all together. The most light some of those have seen for a very long time Jas, nice display mate, love the dowel hanger idea in that old cabinet too. Thanks guys....yeah pete looks good, sheds a mess, needs a complete makeover, time time time. will eventually get it up on the wall. Some really great Lures you have made in time Pete. Actually got quit surpriced when i saw the pict. Jason put up off your old Lures. Some look very much like an old Danish stick bait made in the 70´ties. Here are Jasons pict, and some pict from a Danish book published in 1981. I can't remember P.J, no internet then but probably copies of 'Bellbrook' style lures, made from wooden beads bought from a craft shop---- They always looked promising but I could never get them to work- I know now, with a little bit of lead in the base they probably would have - I also notice I was big on 'eyes', even back then . Look forward to seeing the finished lures P.J--Will be interesting to see what colours the 'juniors' use on them.